We decided to start our December update with one of the last picture we had taken in 2011. Here we are celebrating New Year's Eve at a local night club with lots of friends and family. Broken arm and all, it was another great year and fun evening! 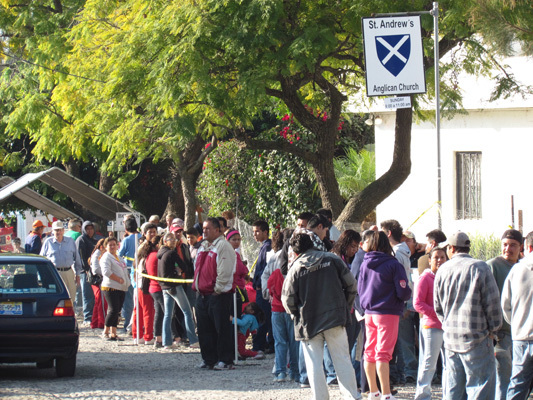 The first part of December was a culminating event to a lot of volunteer work that Glorine and many other expats did to prepare for the largest yard sale held here at lakeside. All the proceeds from the donated clothing, books, jewelry, etc. went to local charities. This picture was taken about an hour before the event started--kind of like Black Friday! 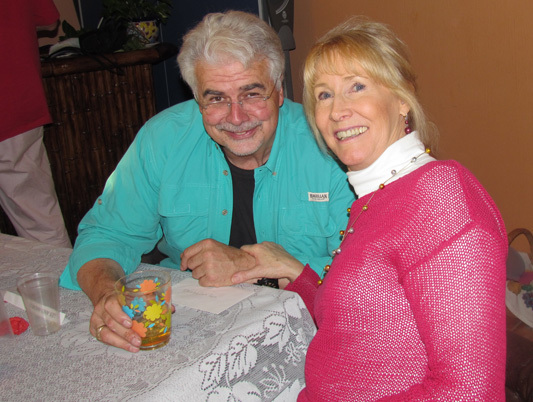 Maureen (on the right) and her husband Keith hosted a wonderful lunch with several friends one Sunday afternoon. 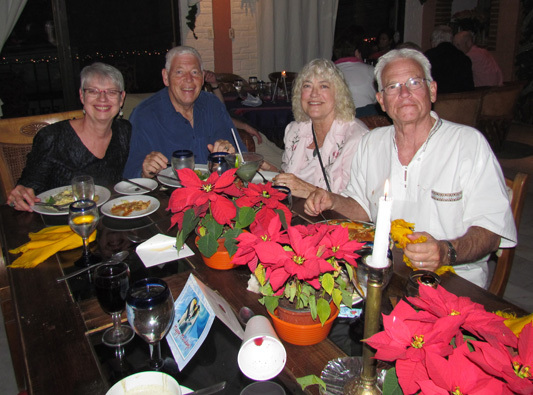 They have a beautiful view home overlooking the city of Ajijic, the lake and the mountains. Pictured with her are Donna and Sally. It was a nice relaxing pre-holiday treat. Here are two orthopedic surgeons working to adjust Larry's broken arm. 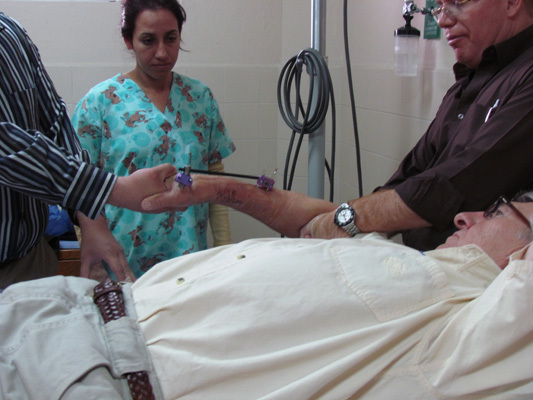 He had been wearing this "external fixator" to stabilize his arm and to allow for periodic adjustments since November 13. Healing bones at this age is a slow process. 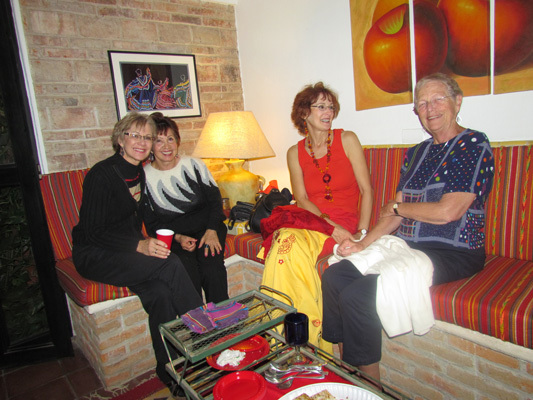 Parties are a part of the fabric that makes Ajijic such a wonderful place. 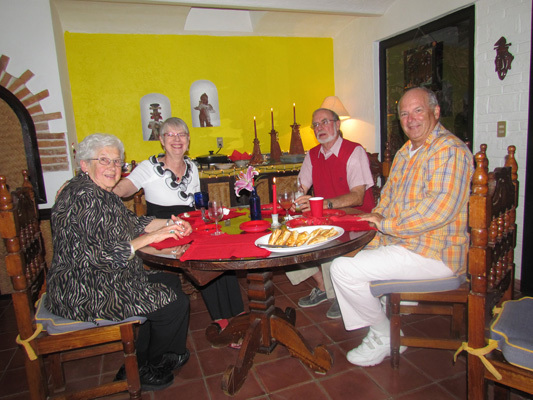 To accommodate all our friends in our little villa, we had three holiday parties in one week. Here left to right is Lil, Norm, Alistair, Jerry, Gloria, Quinton, Donna, Chuck, and Rose. Glorine and Jean are getting ready for desserts. Another day, another party. Here with Wayne, are our first landlords--Ken and Lise Clark, whom we rented from when we first started wintering in Ajijic. They are visiting with another friend we made during our first year here. In fact, we visited Pat (and his wife Ardell) this summer while RVing in Canada. Here, next to Glorine on her right is Ardell and on her left is Helen--one of the most courageous single women we know in Ajijic. 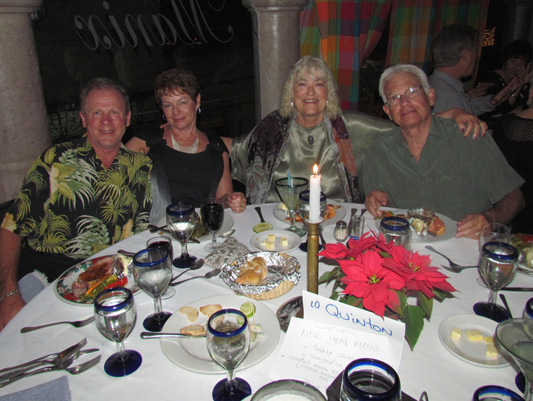 On the left is a couple we met on our tour to the Caribbean last year, Walt and Connie, with her mom, Jerry. 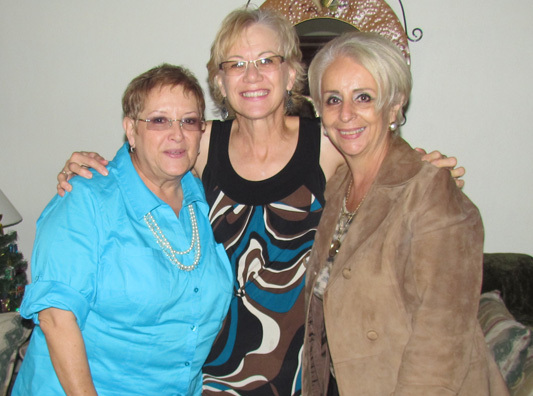 Here is Glorine with two friends we met from Guadalajara, Yvonne and Tere. They too, we met during our first winter in Ajijic at a weekly get-together called Los Amigos (the friends). And how lucky we were to be at the right table at the right time. 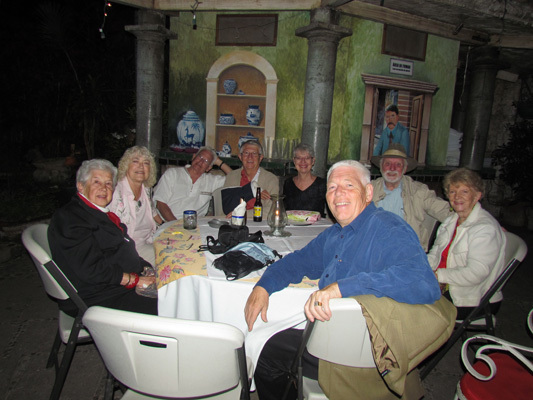 Talking of Los Amigos, here we are at a weekly Wednesday get-together with friends. The two-for-one happy hour helps make this event a success. Another tradition we started is a monthly birthday celebration for all our friends who have birthdays in that given month. 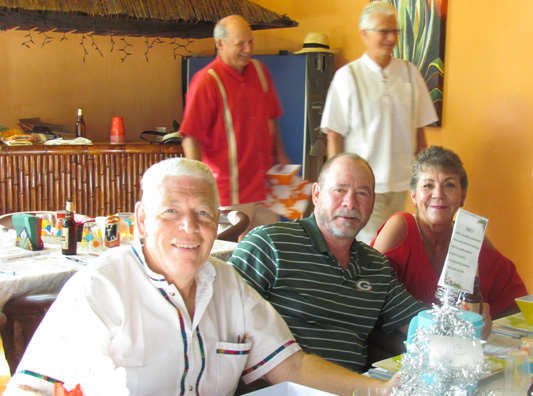 Here is Marilyn, Brian, Jean and Chuck joining in to help celebrate those with birthdays. And here is one of our favorite bands, Blanco (vocalist) and Ricardo (at the keyboards). They are legendary in Ajijic. 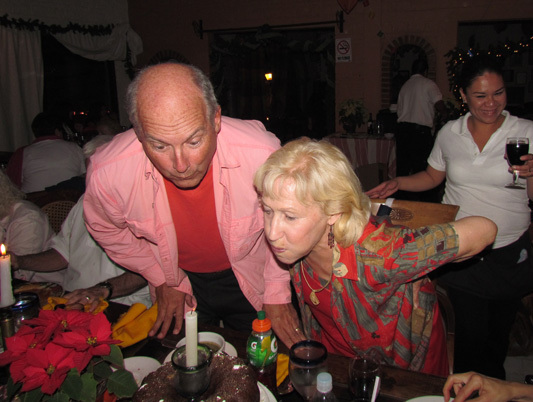 And here are two of several people celebrating their birthdays (Wayne and Carolina) blowing out a candle and making their birthday wishes. 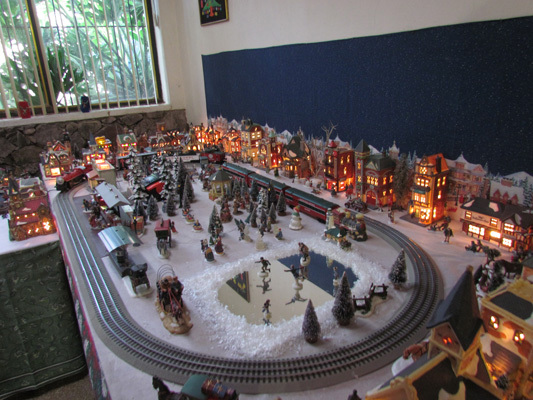 Another exciting treat during the holidays is a parade of homes, all decorated for the season. Now this is one couple who really got into the Christmas spirit by displaying their memorabilia. Every room in this house was filled with decorations--almost overwhelming. The last of the four homes we toured was especially unique, in that it had one of the original monasteries built as a part of a hacienda back in the 1530s. Glorine met the owner last year in her ZUMBA class. While the home has been modernized the little chapel remains much as did when it was built. Little Theater is one of several local venues for live performances put on by everyday retirees of Ajijic. 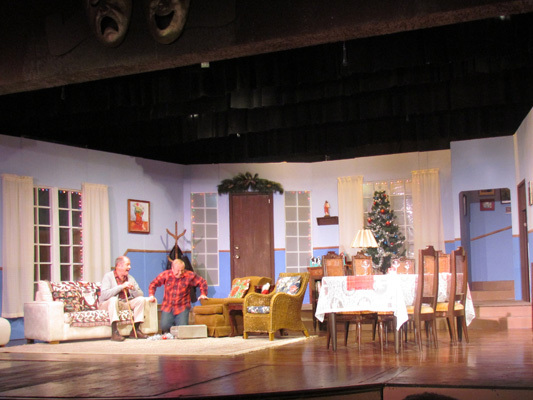 This play was the "Greetings" with a cast of five actors. They had us in stiches and tears. Another treat here at Lakeside is a 400 year-old tradition started in Spain called Las Posadas. It is a nine-day celebration beginning December 16th representing the nine months of the Virgin Mary's pregnancy. 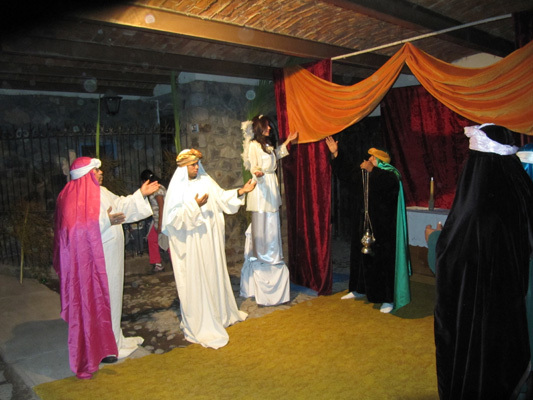 Here are several villagers standing like statutes representing the three kings. What would Christmas be without caroling. 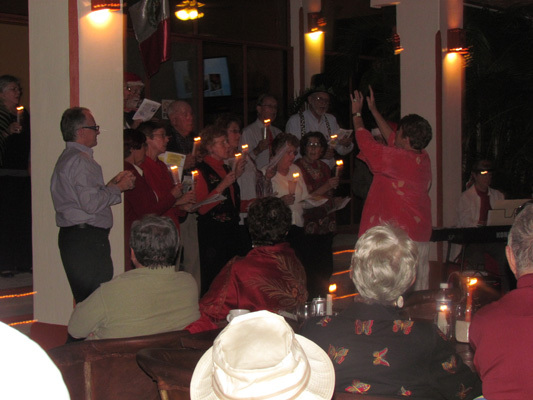 Here we are at the El Parque clubhouse with Christmas carolers entertaining the crowd. 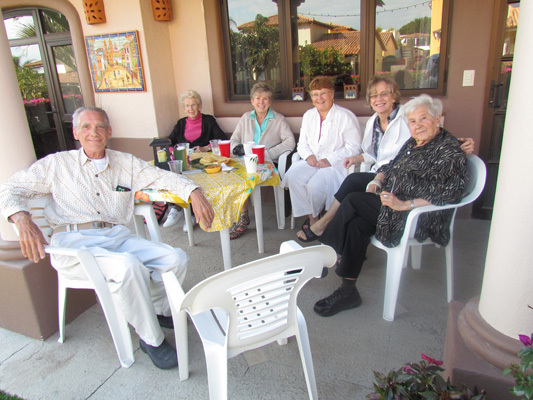 Beforehand, Wayne and Maureen invited a couple dozen friends over for chili and a happy hour before joining in with the sing along. 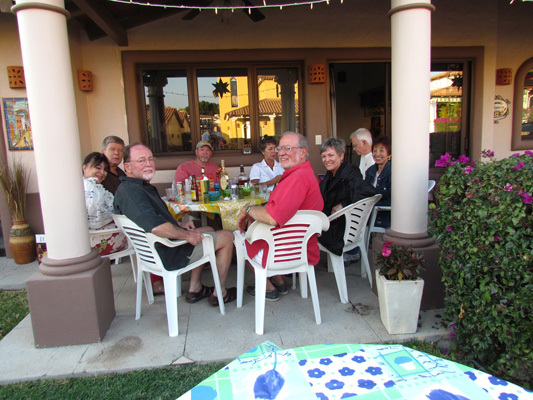 On Christmas Eve, friends Chuck and Jean entertain dozens of friends, a few shown here. 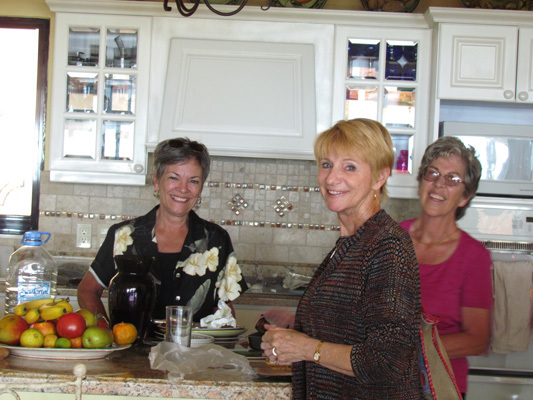 Here is Glorine with Rose, Maureen and Carol. 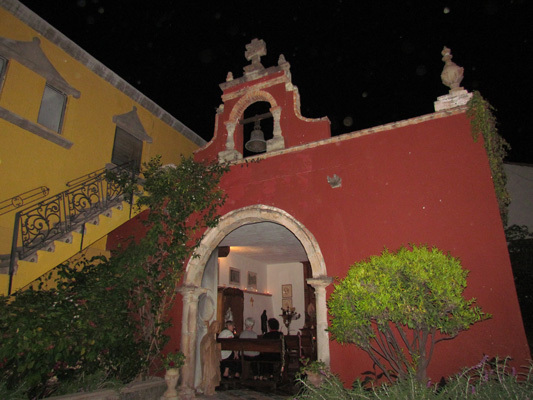 Their casa is in the village and has a unique Mexican decor. 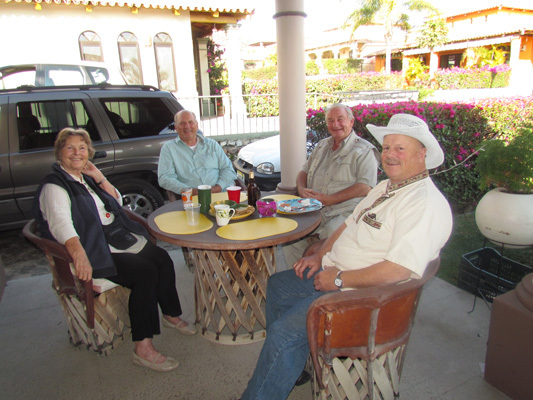 In another area of the casa, are more guests, including Helen, Marilyn, Quinton and Wayne. Another wonderful evening in the charm of Mexico. 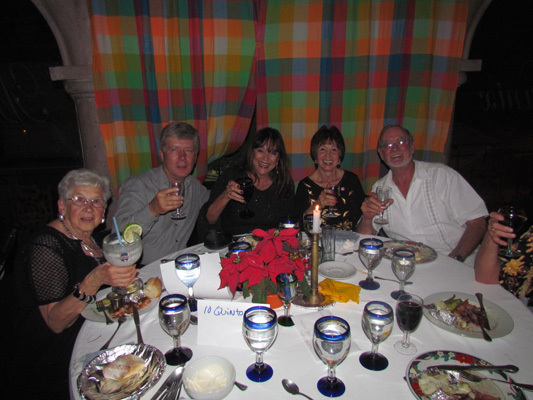 Christmas Day we inviting a dozen friends to join us at the El Parque clubhouse for turkey and all the dressings. Here Brian, Jerry and Gloria are waiting their turn to line up for the great feast. 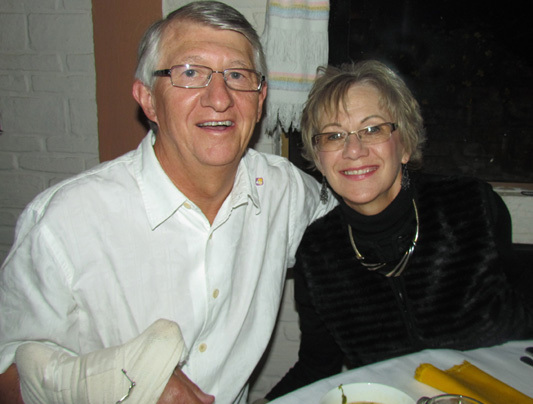 This is Les and Michelle, friends who had just arrived from the states. It was nice catching up with them. Kayaking has grown significantly since we first started coming to Ajijic. Thanks mostly to the effort of our brother-in-law, Wayne. 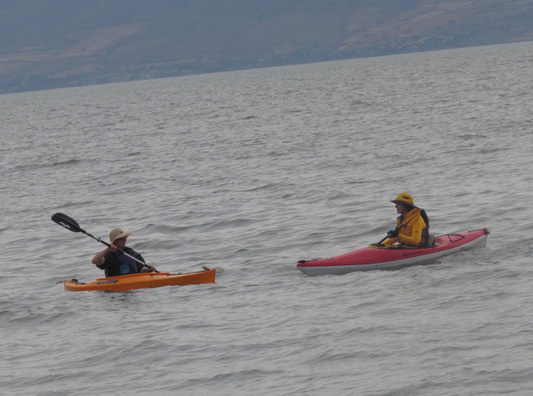 Here he is taking Glorine and Maureen on a sunset paddle on Lake Chapala. December 28th is our anniversary. 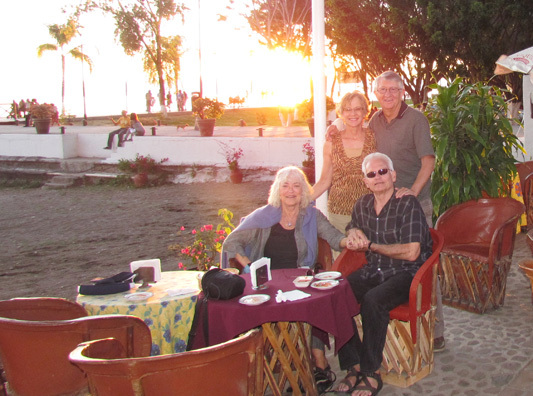 Here we are enjoying a wonderful sunset with Chuck and Jean, who also got married on December 28, 1968. From here, we went to a great restaurant overlooking the lake to break bread and celebrate the special occasion. The next day, we were join by sister Marlene, for the third year in a row. 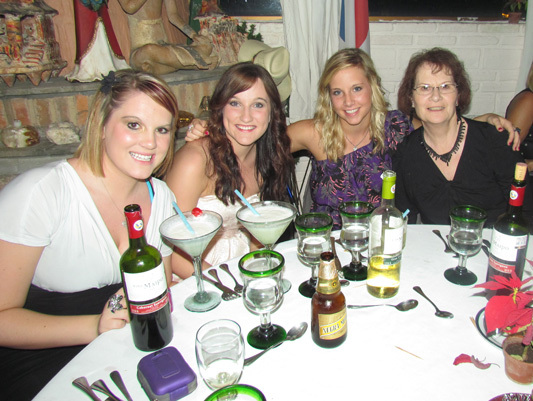 She brought another three of her grandchildren, Cassi, Cami, and Jordyn. The day was spent relaxing at the thermo-spa near Ajijic. 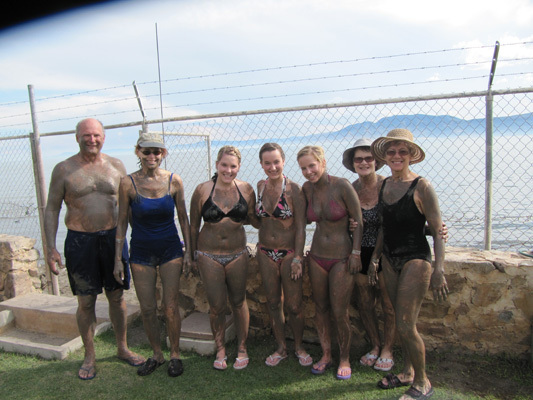 Here they are posing following a traditional mud bath. 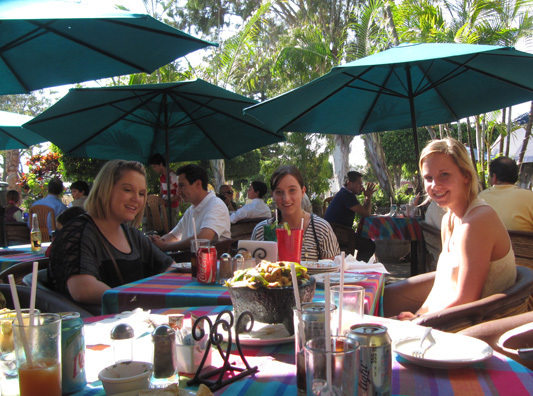 Here we took the girls to a nice outdoor restaurant overlooking the plaza in the center of Ajijic. They are about to experience their first Molcajete (mole-cah-het-ee), which is a Mexican dish cooked and served in this large stone cooking utensil kind of like a fajita. They liked it! 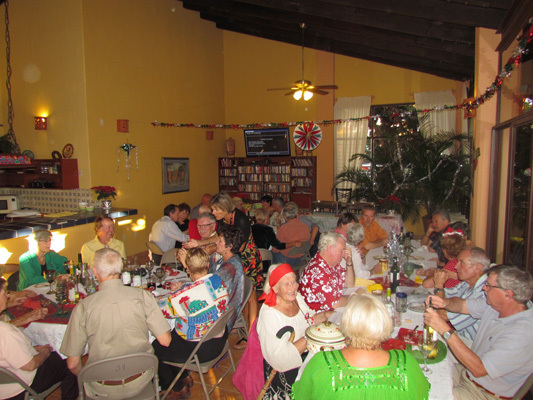 Our last event for 2011, was a big treat--New Year's Eve. Here the girls are posing with their grandma looking on. Being 17, 18, and 19, this was the girls' first New Year Eve at a night club. And what a great experience that was. 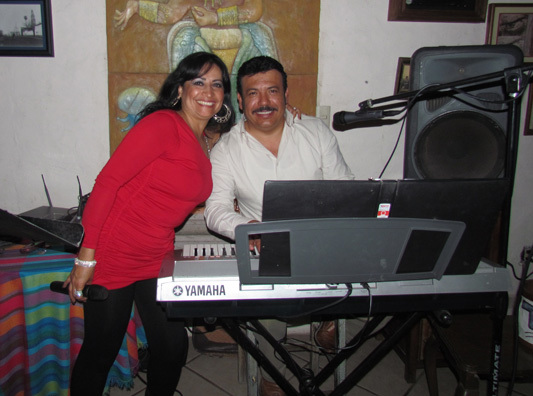 Ricardo and Blanco provided the music which set the tone of fun, dancing and lots of merriment. Here are a few of our friends decked out for the evening. And here are a few more!!! At midnight, we each got a cup with 12 grapes, which we were to eat one for each time the church bell struck down to 12 midnight and to make a wish for each grape we eat. 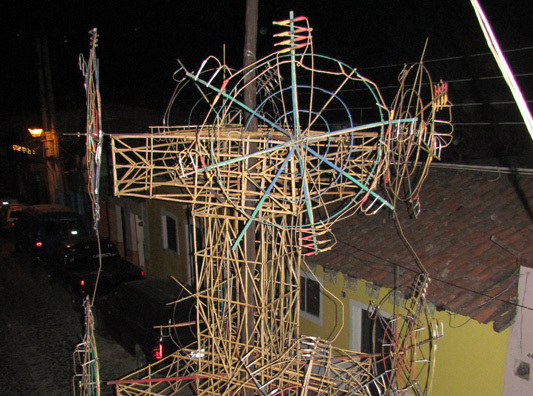 Also, the night club had a fireworks display called a Castillo erected on the street just outside the restaurant. It was a dazzling event. After the fireworks went off, we kept ringing in the new year until 2:00 a.m. 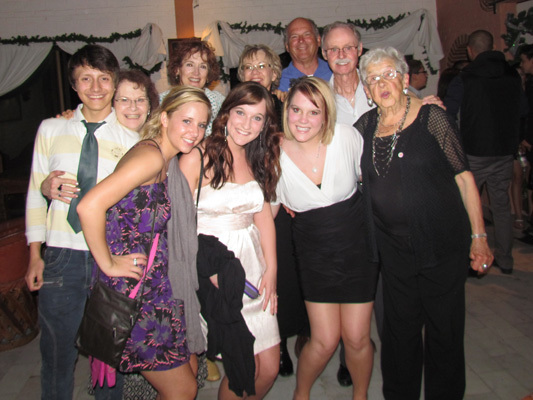 Here is the family, with a couple of new friends who joined us for a fantastic beginning of 2012.